This view looking southeast of Bells Gap overlooking Logan Valley is seen from a vantage point about a half mile deeper back into the gap and several hundred feet higher than Point Lookout. The darkest spot near the lower left corner is formed by the open tree canopy of the old railroad bed at the point of the ridge and is the approximate location of Point Lookout. Bellwood reservoir is clearly visible just right of center, supplying the water needs of the southern portion of our district. 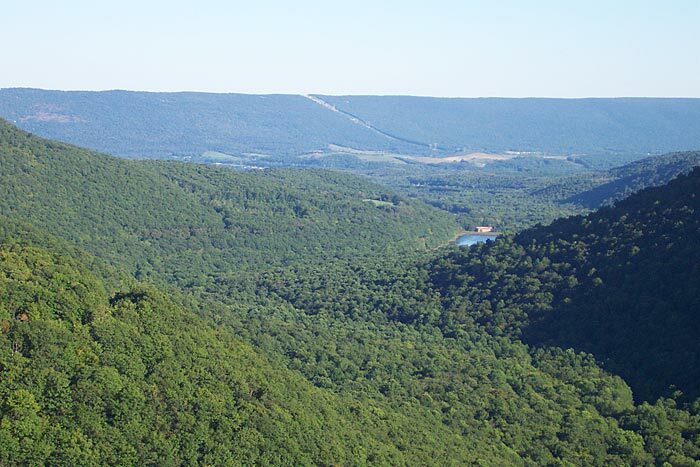 This gap, along with Tipton Gap several miles to the northeast (left of this view) represent two of the deepest interruptions along the entire Allegheny Front. Miles away, Brush Mountain appears in the distance with the power line sweeping up its side carrying electricity to eastern Pennsylvania. For a view taken from the power line looking northwest toward Bells Gap click here.